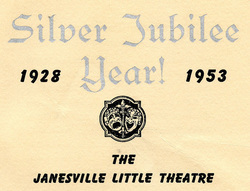 Post World War II prosperity ushered in a Golden Age for Janesville Little Theatre. It began what was certainly the most productive period of our history. The list of productions for the next two decades, which were quite contemporary at the time, today reads like a textbook of classic English Literature.